Race-Recovery Index: Is Stimulus Helping Communities in Crisis? Home · Research · Race-Recovery Index: Is Stimulus Helping Communities in Crisis? 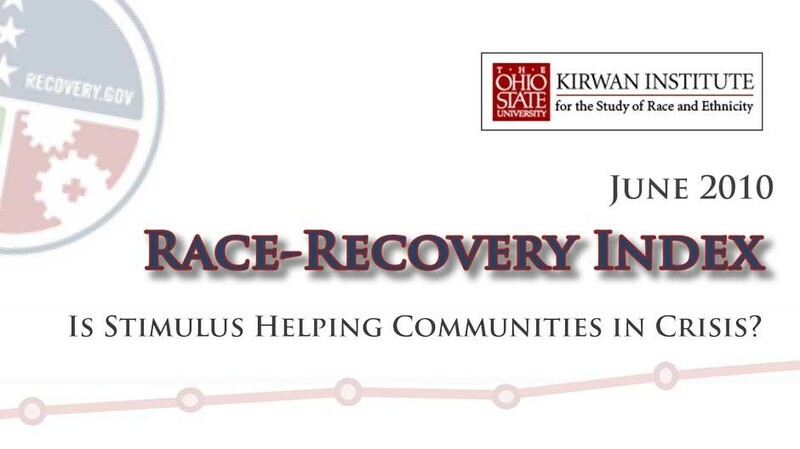 The Race-Recovery Index, a project of the Kirwan Institute, is designed to measure how all people, but particularly marginalized populations, are faring in the midst of the national recovery efforts. The two primary tools for measurement used on a monthly basis are the national unemployment figures by race, and the Federal contract procurement of the American Recovery and Reinvestment Act of 2009 (ARRA). Additional forms of measurement may eventually be added.